Anna Adamec observed her 100th birthday with a huge party Sunday at Neillsville Care and Rehabilitation. She sat down with her daughter Marian before lunch Wednesday to share details about her long and rewarding life, in between sorting through a large stack of Christmas cards that came in the daily mail. Anna was born in West Allis Dec. 22, 1913. Her parents, Frank and Christine Sojka, moved to a farm nine miles west of Pittsville in the Town of Hiles in Wood County when Anna was three years old. Anna was the second of seven children. She had three brothers, Frank, William and Wencil and three sisters, Christine, Barbara and Francis, who died as an infant. They established a homestead farm with 80 acres Frank cleared by hand. He also established a small blacksmith shop on the farm. Frank built a 16-foot by 16-foot house with an addition for use as a barn, accommodating a team of horses and eight dairy cows. Eventually, the operation expanded with another barn with a haymow being added, along with another eight cows. By age nine, Anna was assisting with the car of her twin brothers and younger sister. “I remember helping with the cleaning and cooking,” Anna said. “I fed corn starch pudding to the kids while dad was picking potatoes.” The family had a large garden. Anna picked beans, and by age 13, was milking eight cows by hand and helping to feed chickens, geese, goats and ducks. Frank kept expanding the homestead. Eventually, a total of 240 acres were cleared. Anna said a nephew, Donald Sojka, still owns the original 80-acre parcel. Anna attended the Scranton country school through the eighth grade. She kept helping on the farm until she was hired as a nanny for a family in Wisconsin Rapids, doing housekeeping work and carrying for children. That was a line of work she continued in for a while, moving on to Milwaukee to work as a housekeeper for the Dr. Hermann family with three children. In the mid 1930’s, Anna moved to Chicago to be a nanny for a pharmacist’s family with two children. On a visit home, Anna met Anton (Tony) Adamec at the Palms Supper Club in Hatfield. After a three-month courtship, Judge Schoengarth married them at Neillsville at the Courthouse Nov. 26, 1938. Anna got back into the rural lifestyle with Tony, who had a farm in the Town of Levis. They had three children, Marian, John and Anton (Tony), who passed away two years ago. Anna put her upbringing to work on the farm. She did a lot of cooking, baking and canning, along with tending a garden, helping with haying and caring for geese and chickens. She also milked 15 cows by hand when her husband took a job at the Farmer’s Union Mill in Neillsville. In the winter months, Anna made rag rugs out of strips of fabric. Anna and Tony love to dance the polka, waltz and fox trot at the Silver Dome and at the Palms Supper Club. She also enjoyed tending her flower garden and feeding birds. Many friends, particularly deer hunters, made the Adamec’s house a regular stop to partake of coffee, apple strudel and Anna’s specialty, Kolaches. 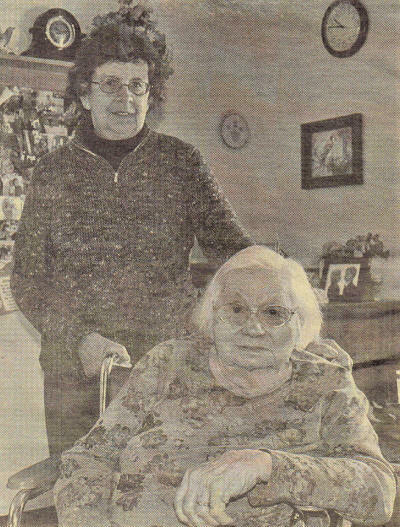 For many years, Anna served as secretary of Bohemian WFCA Lodge #303 in the Town of Levis. She is still a member of Bohemian Lodge #303 in Pray. In the mid 1960s, Anna and Tony went on a month-long vacation to California. They visited relatives and took in sights, including the Redwood Forest, Grand Canyon, Las Vegas, Lake Tahoe, The Corn Palace, the Black Hills and Mount Rushmore. They also took shorter trips to visit relatives in Arkansas and Louisiana. “For the most part, they just stayed home on the farm to raise a family,” Marian said. Anna’s husband Tony died in 1990. She has kept busy with her grandchildren, Amy, Lisa, David, Gary, Duane, Cherri, Sheila, Kay, Sheri, Sheli, Rob and J. B., along with 12 great-grandchildren. Anna was able to stay on the farm until 2003, when she moved to Neillsville Care and Rehabilitation. She had cataract eye surgery years ago, and is now pretty much confined to a wheelchair. She enjoys word-find books and participating in many activities, including music, picnics, card games and watching Wii bowling games. Family members and friends from Connecticut, Michigan, Minnesota and the Milwaukee area attended Anna’s 100th birthday party Sunday at Neillsville Care and Rehabilitation.